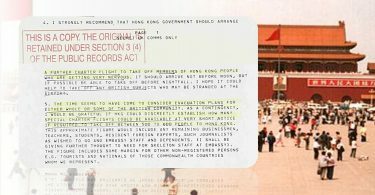 The Tiananmen massacre unfolded on June 4, 1989 ending months of student-led demonstrations in China. 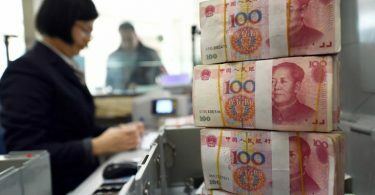 It is estimated that hundreds, perhaps thousands, of people died when the People’s Liberation Army was deployed to crack down on protesters in Beijing. See our special section on the day that shook the world. 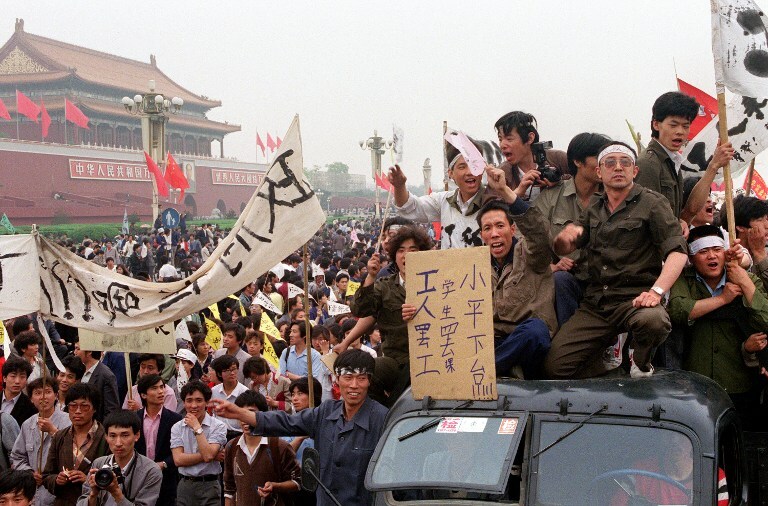 22 April 1989 – Students gesture and shout slogans as they pay respects on in Beijing to former Chinese Communist Party leader and liberal reformer Hu Yaobang. Photo: Catherine Henriette/AFP. 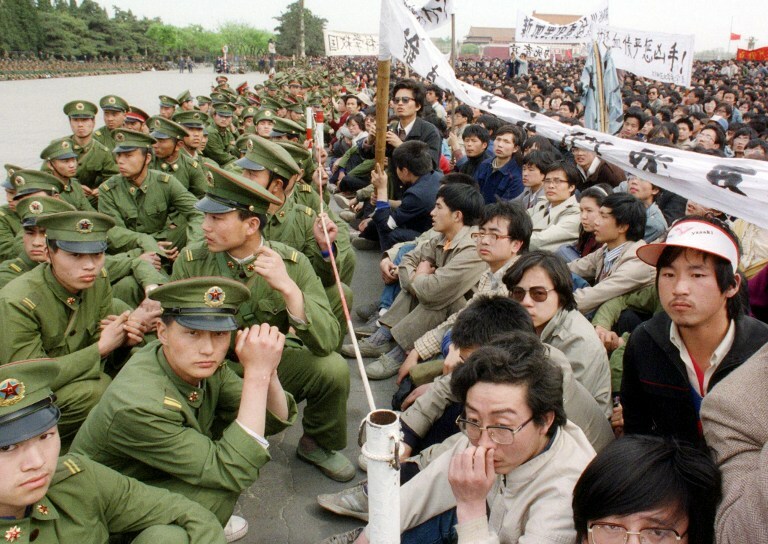 A picture dated 22 April 1989 shows several hundred of 200,000 pro-democracy student protesters face to face with policemen outside the Great Hall of the People in Tiananmen Square. Photo: Catherine Henriette/AFP. 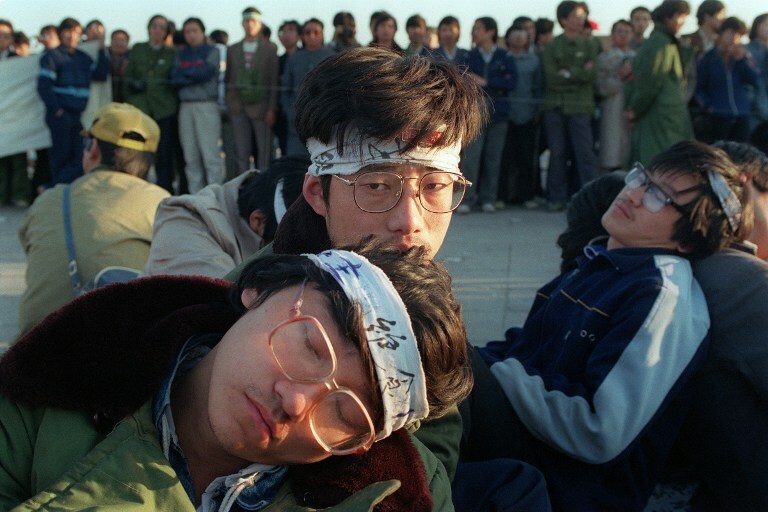 Student hunger strikers from Beijing University relax on 14 May 1989 as several hundred students stage a huge demonstration at Tiananmen Square. Photo: Catherine Henriette/AFP. 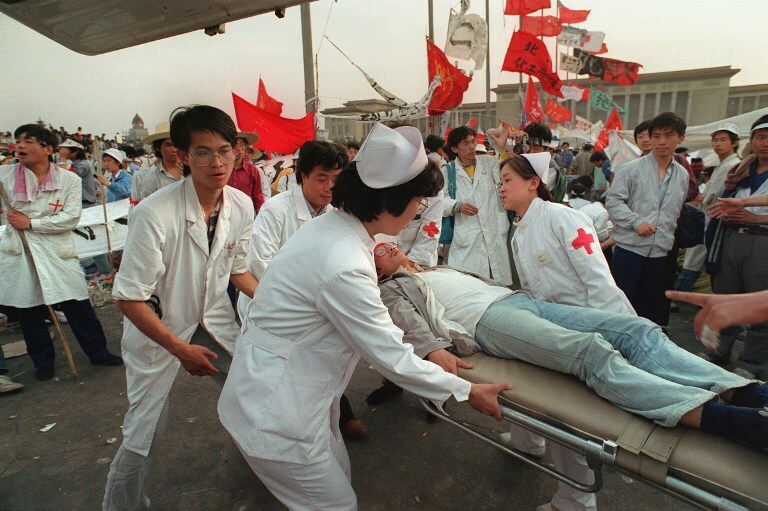 Paramedics evacuate an ailing student student hunger striker from Beijing University 17 May 1989 at Tiananmen Square as students enter the fifth day of a marathon hunger strike as part of mass pro-democracy protest against the Chinese government. Photo: Catherine Henriette/AFP. 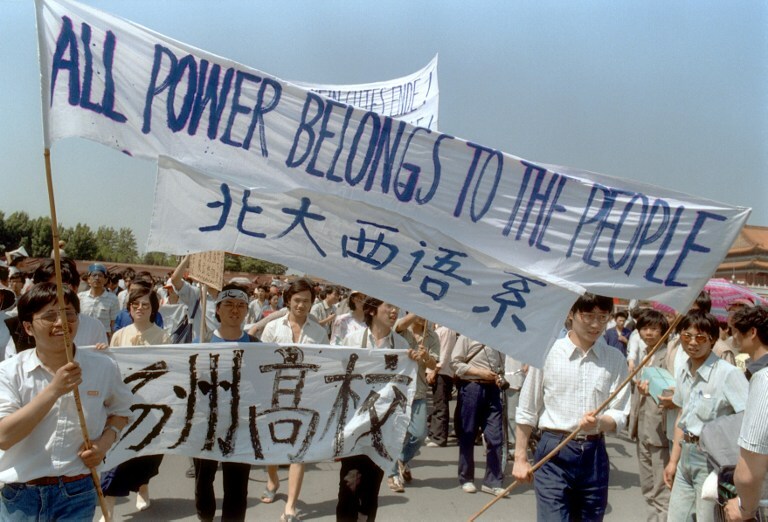 Beijing residents holding placards written in English walk in procession on May 18, 1989 in support of student hunger strikers. Photo: Catherine Henriette/AFP. 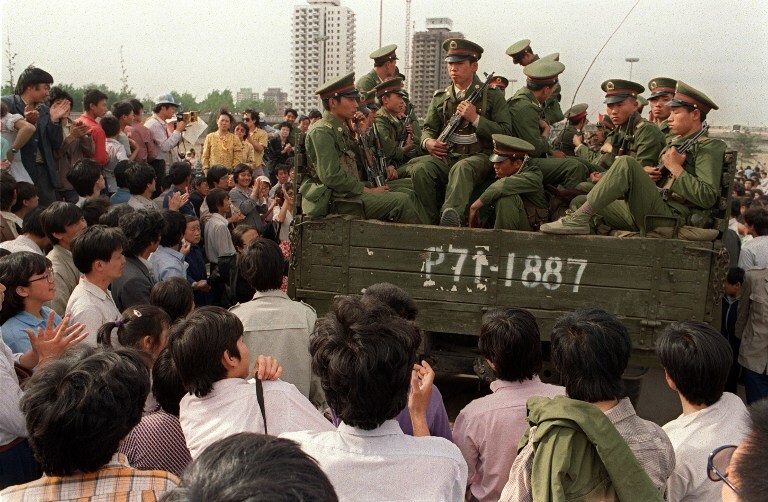 Pro-democracy demonstrators surround a truck filled with People’s Liberation Army (PLA) soldiers 20 May 1989. Photo: Catherine Henriette/AFP. 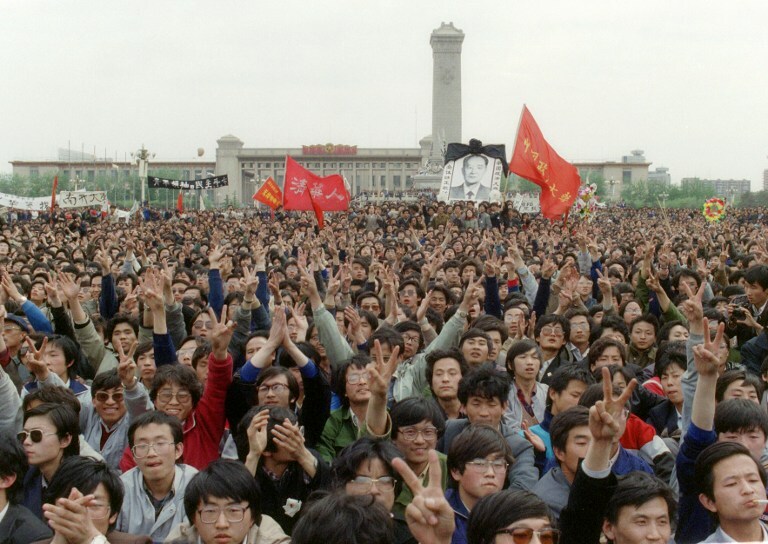 More than a million Chinese workers filled the streets of Beijing on May 18, 1989 to support the students’ pro-democracy movement and their hunger strike. Photo: Catherine Henriette/AFP. 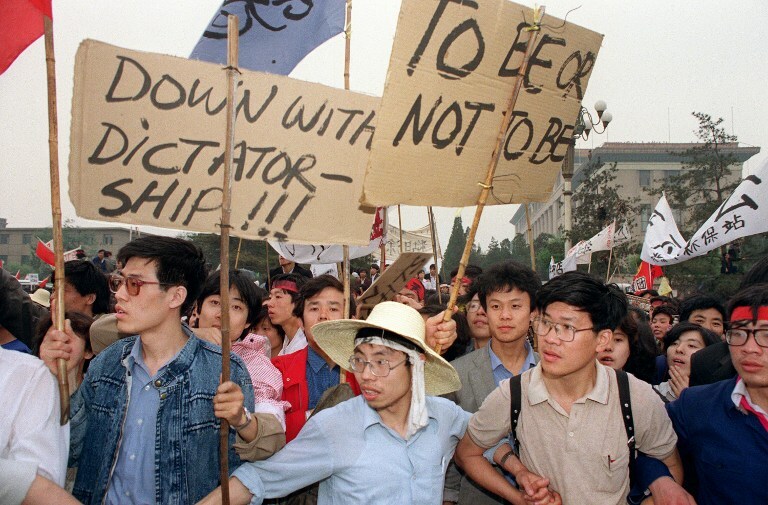 Waving banners, high school students march in Beijing streets near Tiananmen Square on 25 May 1989 during a rally to support the pro-democracy protests. Photo: Catherine Henriette/AFP. 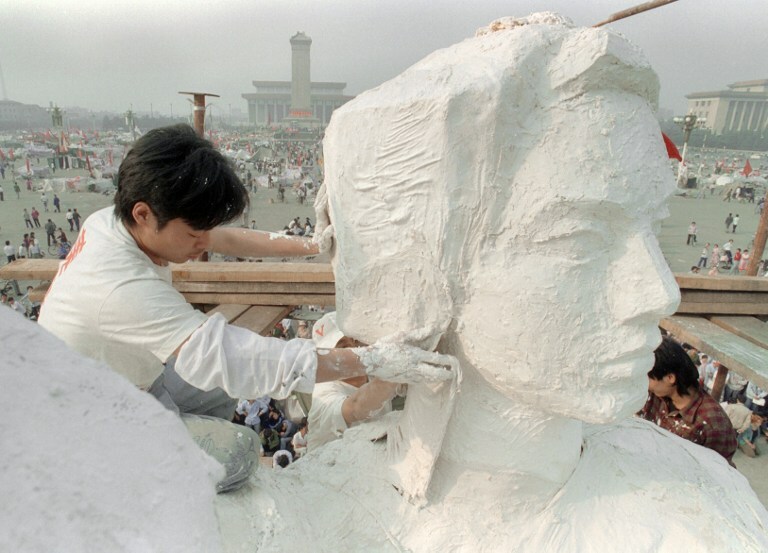 A student from an art institute plasters the neck of a “Statue of Liberty” replica, known as the “Goddess of Democracy” – 30 May 1989 – in Tiananmen Square. The statue was unveiled in front of the Great Hall of the People (R) and the monument to the People’s Heroes (C) to promote the pro-democracy protest against the Chinese government. Photo: Catherine Henriette/AFP. 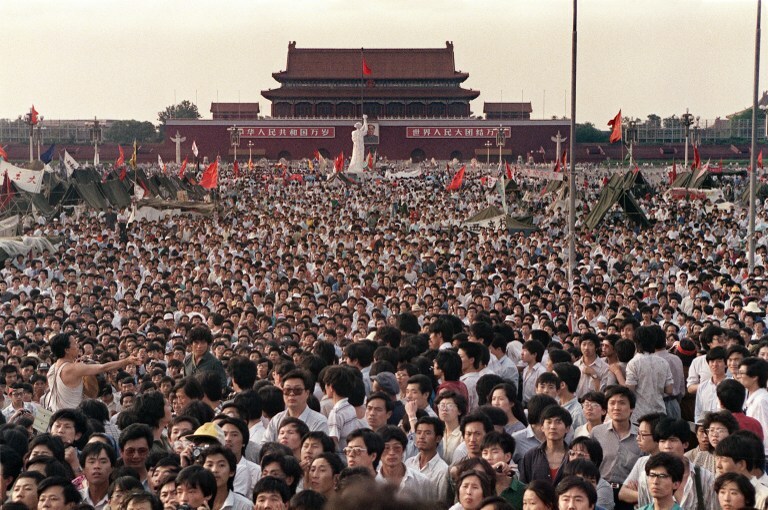 This file photo taken on June 2, 1989 shows hundreds of thousands of Chinese gathering around a 10-metre replica of the Statue of Liberty (C), called the Goddess of Democracy, in Tiananmen Square. Photo: Catherine Henriette/AFP. 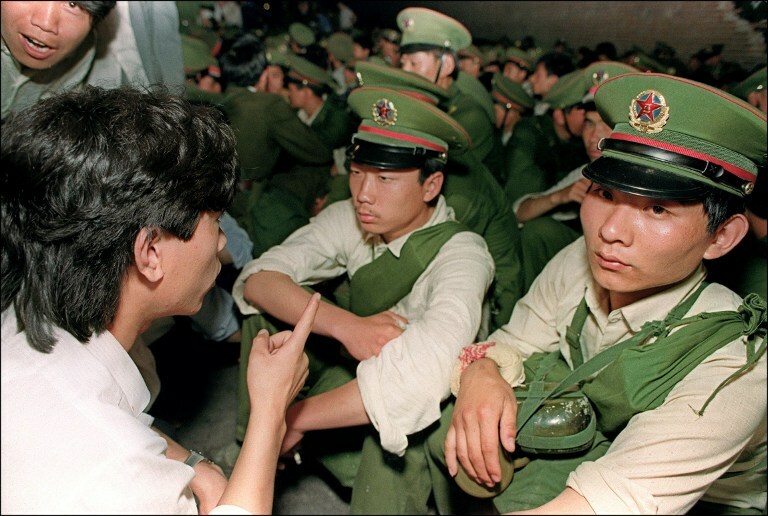 A dissident student asks soldiers to go back home as crowds flooded into central Beijing on 3 June 1989. Photo: Catherine Henriette/AFP. 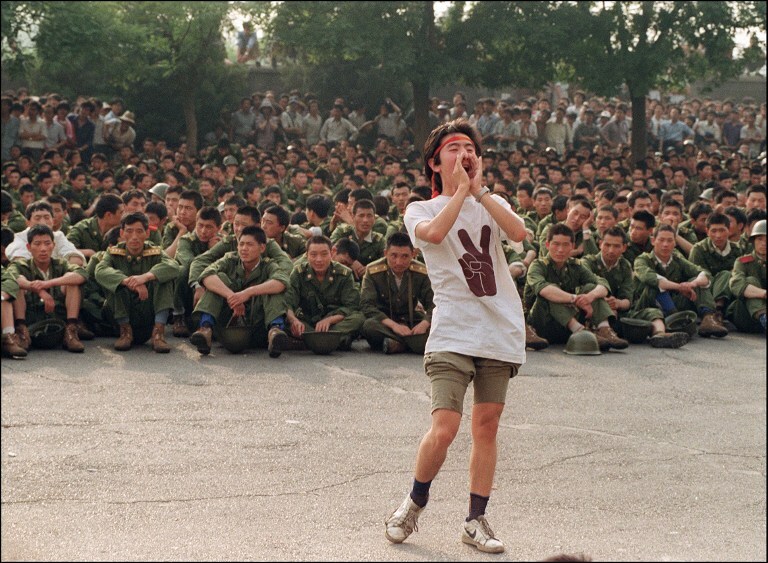 A dissident student asks soldiers to go back home as crowds flooded into the central Beijing, 3 June 1989. Photo: Catherine Henriette/AFP. 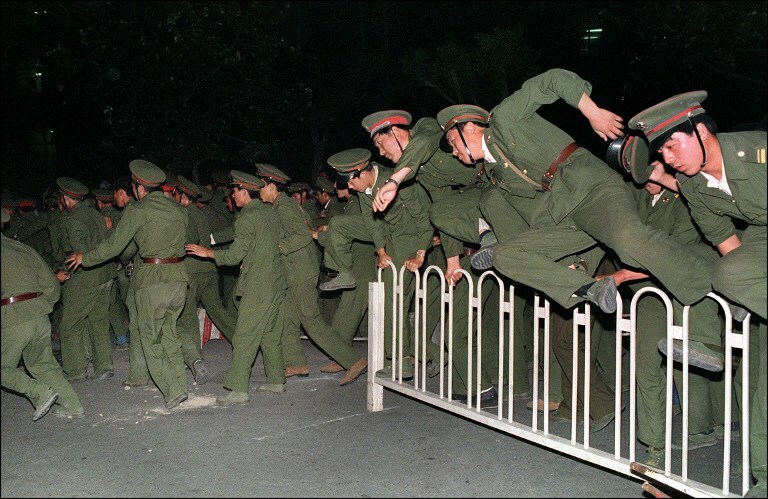 In a file picture taken on June 4, 1989, People’s Liberation Army (PLA) soldiers leap over a barrier on Tiananmen Square in central Beijing. 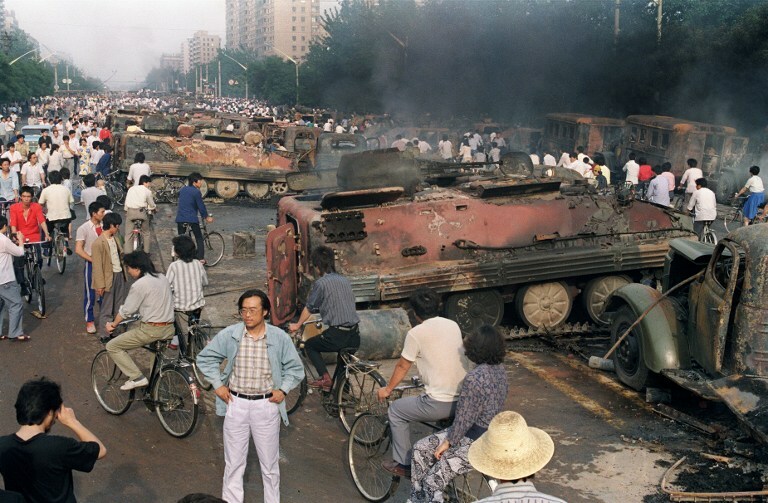 Hundreds, if not thousands, of people were killed in central Beijing on the night of June 3-4, 1989. Photo: Catherine Henriette/AFP. 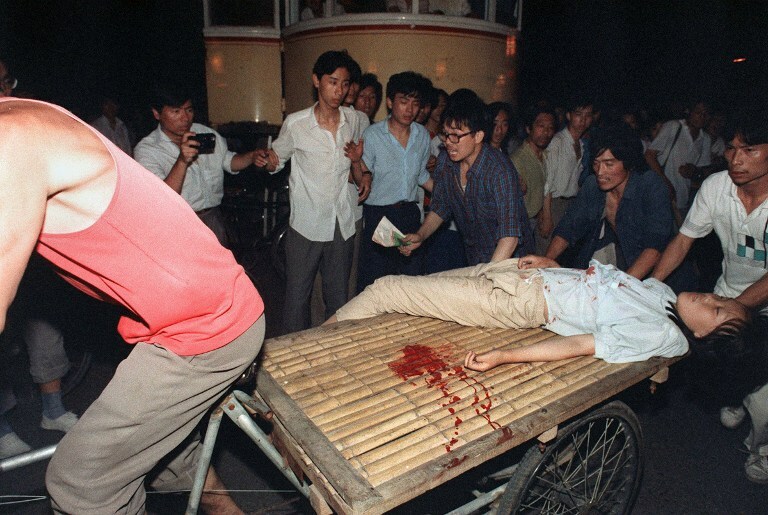 June 4, 1989 – A girl wounded during the clash between the army and students near Tiananmen Square. Photo: Catherine Henriette/AFP. 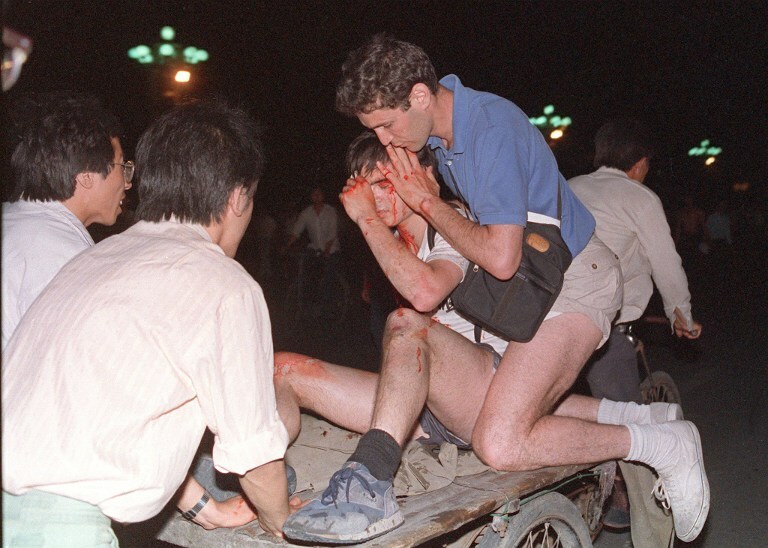 Taken care by others, an unidentified foreign journalist (2nd-r) is carried out from the clash site between the army and students on 4 June 1989 near Tiananmen Square. Photo: Tommy Cheng/AFP. Beijing residents inspect the interior of one of over 20 armoured personnel carrier burnt by demonstrators to prevent troops from moving into Tiananmen Square, 4 June 1989. Photo: Manuel Ceneta/AFP. 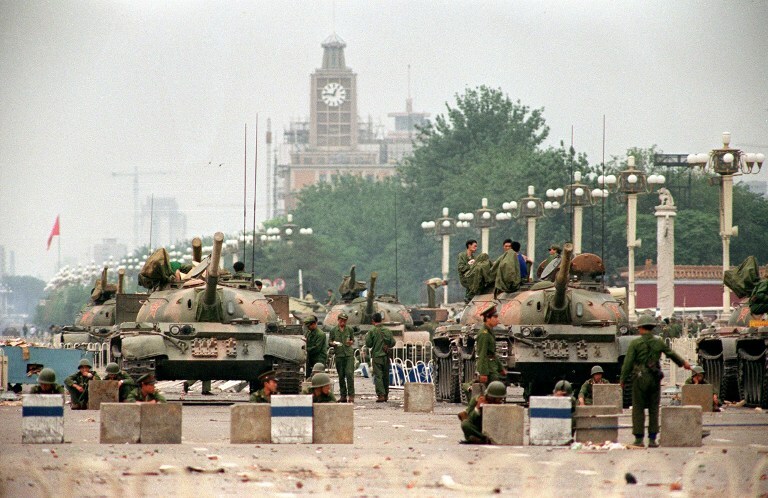 This photo taken on June 6, 1989 shows People’s Liberation Army (PLA) tanks and soldiers guarding the strategic Chang’an Avenue leading to Tiananmen Square in Beijing two days after their crackdown on pro-democracy students. Photo: Manuel Ceneta/AFP.